I recently was reminded about a really interesting carving I noticed on my last visit to Kilmacduagh, Co Galway. Kilmacduagh is an early medieval monastic site founded by St Colman son of Duagh in the seventh century. The site is located a short distance from the town of Gort Co Galway. Today the surviving ruins of the monastic settlement consist of a round tower, a cathedral, two smaller churches and a small Augustinian abbey. I am planning to do a much more detailed post on the site in the coming months. The cathedral is the largest of the surviving buildings and also possibly the oldest structure at the site. It was probably originally built in the tenth or eleventh century it was extended in the twelfth century and remodelled again in the fifteenth century. The church has many interesting features that are worth discussing in more detail but for the purpose of this post I will only highlight a very unusual carving. The carving can be seen just inside the doorway of the north transept, on the right-hand side as you walk into the transept from the nave. The carving consists of a large face cut into a sandstone block of stone. It is an oval shaped face, of a bald male, with two large ears, almond shaped eyes and a broad smiling mouth. All of his features combine to giving the figure a rather happy expression and when I first noticed the face I could not help but smile back. The carving is most unusual and I have not seen anything comparable in all my travels. Are any of you aware of similar type carvings at other church sites in Ireland or Britain? If I find out anything else about the happy face I will let you all know. 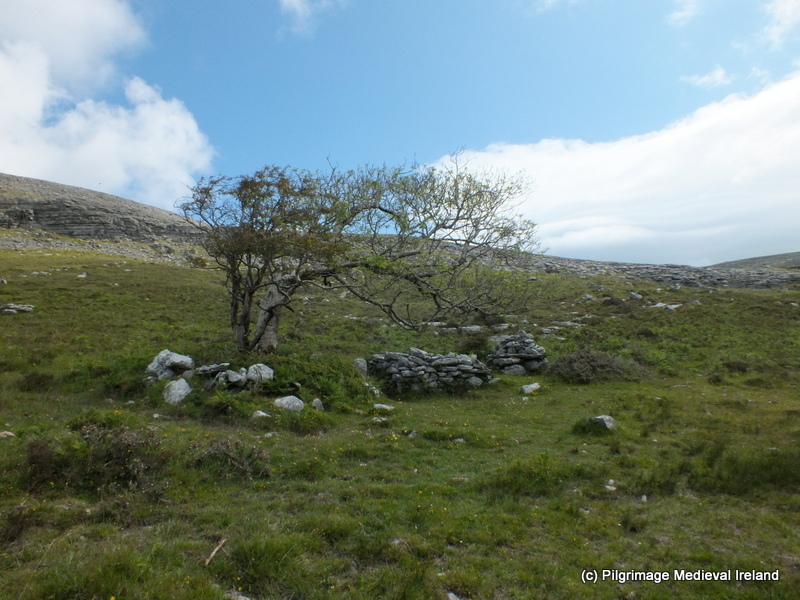 Balla in Co Mayo has very ancient roots, and was once the site of a thriving pilgrimage. Balla was also located along the route of the well-known pilgrim road/route the TocharPhádraig. Tradition holds that Tóchar was a medieval road that linked Croagh Patrick to important settlements such as Aghagowel, Ballintubber and Balla and used by pilgrims up until the 19th century when travelling to Croagh Patrick. Despite its connections with the Croagh Patrick pilgrimage, Balla was not founded by St Patrick but folklore tells that the saint rested here while travelling through Mayo. The modern village developed around the site of a seventh century monastery founded by St Crónán also known as a Mo-Chúa. The saint was educated by St Comghall of Bangor and he died in AD 637. Like St Laserian, Crónán choose to settle at Balla because of a divine sign. It was said that a cloud guided the saint to Balla and upon his arrival a spring burst from the ground. Such signs confirmed to the saint that this was where his church was meant to be. We know little of the early settlement established by Crónán. It was seldom mentioned in historical sources and all that survives of the early monastery are the partial remains of a round tower found within a historic graveyard. The tower survives to a height of circa 10m. During the nineteenth century it was used as a bell tower for the local catholic church. Lalor estimates it once stood at a height of 30m. The tower has two doors the lower of which appear to be a late medieval insertion. The lintel of this door re-used an early medieval cross slab. Today the slabs decoration is quite faded and difficult to see. The upper door has traces of Romanesque moulding on its lower course suggesting a 12th century date for the construction for the tower. The changes in masonry style and the stones size within the upper door and the surrounding masonry suggest this section was a later rebuild (O Keeffe 2004, 79-80). Apart from the re-used cross slab the fabric of the tower also incorporates two bullaun stone within the walls. In the 1830s a church was recorded in the vicinity of the tower, the church has long since disappeared although a late medieval altar still survives to the north-east of the tower. The site of the spring which burst forth from the ground on the arrival of Crónán also survives and is located to the west of the graveyard along a small lane that runs along the side of graveyard from the carpark in the community centre. The holy well which burst forth to welcome Crónán to Balla is today known as Tobair Mhuire (Lady Well). When I visited the site in 2014 the well was choked up with silt and the rest house was in a poor state of preservation. The ruins of a 17th century building that was built as a shelter for blind and lame pilgrims is located beside the well. is attended by great numbers of the peasantry at patrons held on the 15th of August and 8th of September(Lewis 1837, 102). The waters of the well were held to have healing properties and were especially good for sore eyes. There are also two little pillars, of mason work , called by the people, Station monuments (Leachta), and used as such, on top of which, are two small stone crosses, one on each, and in which are fixed (in the work of which are placed) two stones, one in each, with inscriptions on them, dated 1733; both are written in English, and under one of them are the words ‘Sun tuum praesidium fugimus, sancta Dei genitrix’. that is – Under your protection, we fly, Holy Mother of God. are two heaps of stones with a cross on each lying down. Beneath those heaps two priests are supposed to be buried. St Cronan himself is said to be buried somewhere near the spot (Balla B roll no. 1146, p 178). As devotion to the well ceased the cairns of stones were removed in the ensuing years. The 19th century devotional rituals engaged in by pilgrims were quiet complex and know as the Long Station. It was said that 15,000-20,000 people would attend the main days of pilgrimage arriving on the eve of the feast during this period (Rynne 1998 183). Prayers began in the graveyard among the tombstones the bare foot pilgrims would kneel and say a Pater, Ave and Gloria ( Our Father, Hail Mary and Glory be to the Father) seven times, they then crawled on their kneels to what was known as the high altar (the altar from the medieval church) within the graveyard , one Pater and fifteen Aves were recited as they made their way to the altar. At the altar they said the litany of the Blessed Virgin, seven Aves and seven Glories. The pilgrims then walked around the graveyard seven times saying fifteen decades of the rosary. Returning to the altar they said the Pater, Ave and Goria five times. From here they continued to the well and at each cairn(mound) near the well they said five Pater Ave and Gloria. The pilgrims then entered the rest house and said a Pater Aves and Gloria five times, after which they turned three times around. The pilgrim rest house was described as unroofed in the Ordnance Survey Letters in 1838. Leaving the rest house pilgrims then went to the well and made the sign of the cross with its waters saying one ave each time. This completed the stations (Rynne 1998, 183). The Schools Manuscripts Essays for Balla also recount a version of the Long Station and it appears by the early 20th centurythe penitential aspect of the pilgrimage had lessened slightly with people now wearing shoes for most of the station. This reaction of the people of Balla to seek protection from their saint is not surprising when one considers in June 20th 1921 the Black and Tans burned the town of Knockcroghery in Co Roscommon. The rise of pilgrim sites like Knock in the later 1800’s sent the pilgrimage at Balla into a steady decline and today the pilgrimage that took place here is a distant memory. If you visit Balla be sure to go to the local community centre where there is a great display dedicated to the history of the site and the area. Green, C. 1875. ‘An Irish ‘Patern’ at Balla County Mayo – The ‘Long station’’, engraved by Eugène Froment, The Graphic 11 (23 January 1875), between pp. 96 and 97. Ill. 899 . Herity, M. 2009. (eds.) Ordnance Survey Letters Mayo. Fourmasters Press. Lalor, B. 1999. The Irish Round Tower. The Collins Press. O’Keeffe, T. 2004. Ireland Round Towers. Tempus Press. 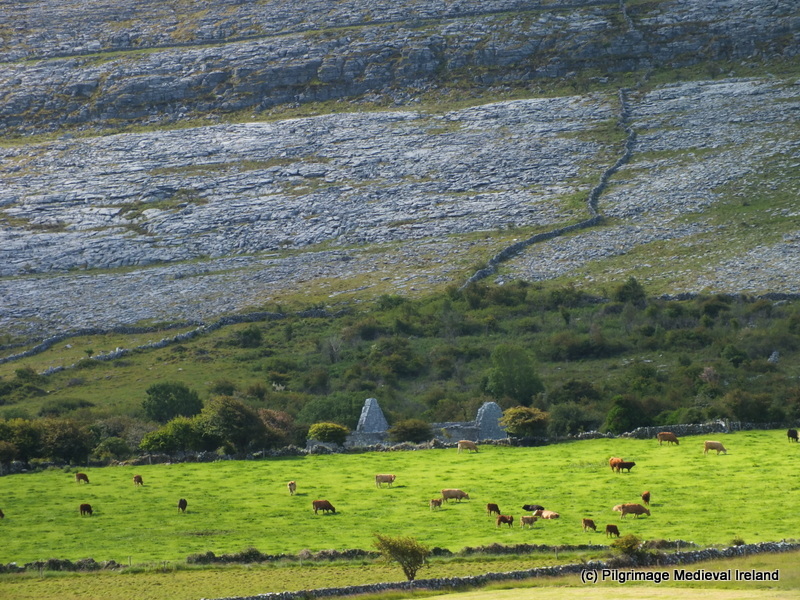 St Patrick is associated with many wonderful sites around Ireland, Ardpatrick Co Limerick is one of my favourite. Located on the edge of a village of the same name, the site is about six miles south of Kilmallock on R512, on the road to Kildorrery in the county of Cork. Sitting on top of a large hill the site consists of the ruins of an early medieval ecclesiastical settlement, consisting of a ruined church surrounded by a modern rectangular graveyard and the stump of a round tower. The site is held to date to early medieval period and the partial remains of large enclosure that once surrounded the site is still visible. Within the enclosure are earthworks of possible buildings, fields banks, enclosures and a road. The name Ardpatrick comes from the Irish ‘Ard Phádraig’ which means the ‘Height or Hill of Patrick’. According to local tradition St Patrick founded a monastery here in the 5th century. A story in the late 9th century work Bethu Phátric, The Tripartite Life of St Patrick, tells us that when Patrick sought a site for the church on Ardpatrick, Derbhall, the local leader, opposed him. He told him that he would believe only if St Patrick removed part of the mountain wall to the south so that he could see Loch Long in the land of Fir Muí Féinne. St Patrick prayed and the mountain melted forming a gap, Bealach Leáite, the Pass of the Melting (Dowd 1896, 49; Limerick Diocesan Heritage). In the ensuing centuries the Ardpatrick was ruled by abbots drawn from the Déisí, the ruling Sept of An Déis Bheag, the territory in which the monastery was situated. The church became a very important and powerful site. It had strong links with Armagh and collected Munster contributions to Armagh. Torlogh O’Connor plundered the church at Ardpatrick in 1127AD and in 1129 Cellach, bishop of Armagh, died at Ardpatrick on Monday 1 April. The O’Langans were hereditary coarbs of Ardpatrick and the lands here remained in their possession and a group known as the ‘Clerks of Ardpatrick’, up to the 16th century (Fleming 2009 ,6). As the name suggest the ruins at Ardpatrick sit at the top of a large hill to get to the summit you follow a small track from the edge of the village. The hill is steep but when you reach the top of the hill you will be rewarded with magnificent views of the surrounding countryside. ‘ apart perhaps from the north end of the west wall, none of its fabric seems to be medieval. It does incorporate large blocks that probably come from a per-Romanesque church. A number of carved stones from windows etc are found scattered around the site and the interior of the church is filled with historic graves. The church and graveyard are surrounded by a rectangular walled enclosure. Ó Carrigáin (2010, 131-132) points out that one of the stones in the stile at the west end of this enclosure incorporates an upside down door lintel which was part of an earlier pre-Romanesque church. Upside down door lintel reused in stile. This stone likely came from a pre-Romanesque church that once stood at the site (Ó Carrigáin 2010, 306). In the past a holy well stood to the southwest of the church. The well is now filled in but was once circa 40 feet deep, faced with stone, and had steps leading to it. 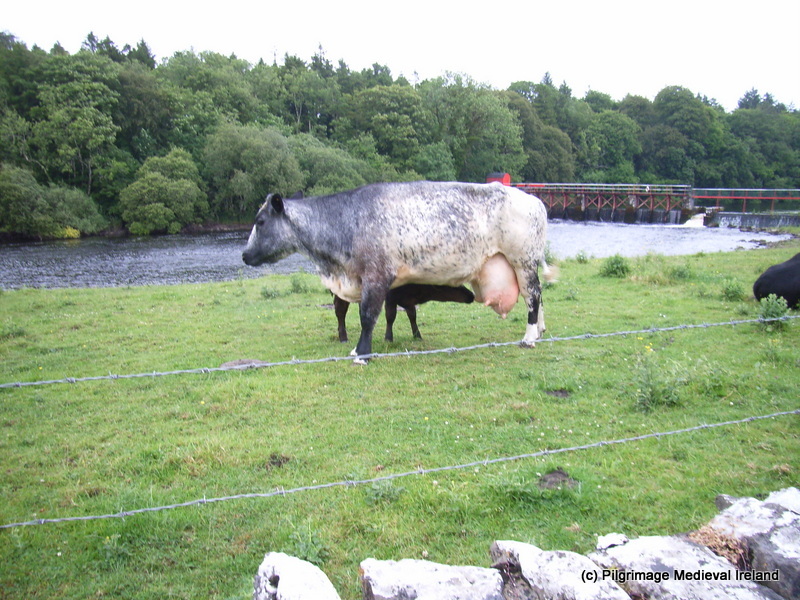 According to legend, cattle are said to have been cured by its water. People visited the well seeking cures for lameness, rickets and rheumatism also used it. There is a holy well now nearly filled up on the hill here. The water lay about 15ft from surface, people said that if on looking down you did not see your reflection in the water you would die before the current year ran out. Outside the graveyard wall are the stump of a 11th-12th century round tower built of dressed stone. Given its location it must have dominated the landscape when built. The tower collapsed in a storm in 1824 and local legend tells of a peal of 7 silver bells which once hung in the tower. When Murrough the Burner was coming from Cashel his soldiers burned Ardpatrick village which my informant says stretched west by south from the old tower. A party of soldiers on guard in the tower were playing cards. They played on top of a powder keg. One of them ‘hit the keg a welt of his fist’ upsetting a candle into the powder. The resulting explosion damaged the tower which was still further damaged by lightning. It was also said that a subterranean passage supposed to exist between the round tower & the old abbey. 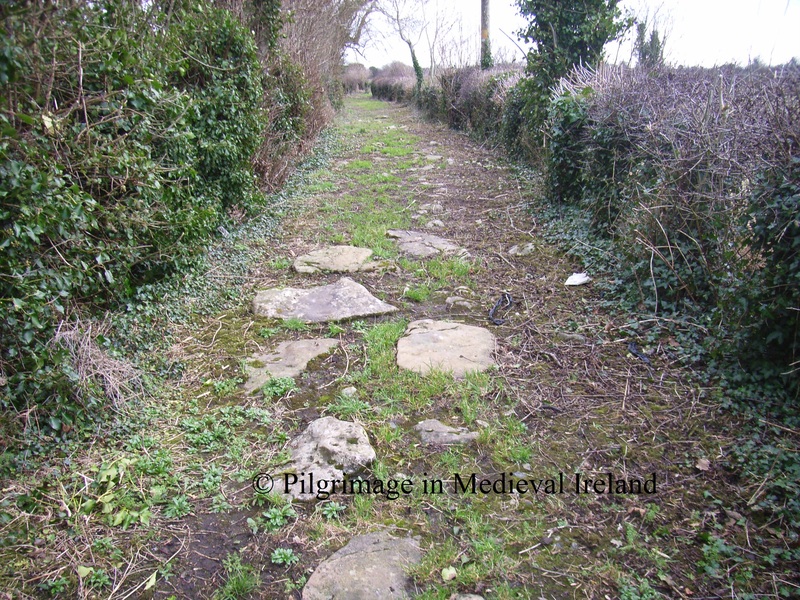 Another interesting feature that survives at the site are the traces of an ancient road way. 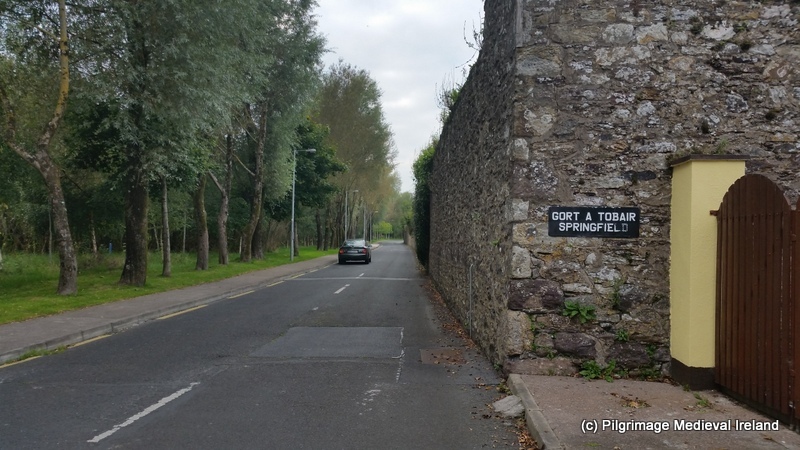 The old road known locally as the Rian Bó Phádraig has discussed this road in a previous post of St Patrick to find out more follow the links. The remains of the old road known as the Rian Bó Phádraig. Fleming, J. 2009. The formation of the church in Limerick’. In Limerick History and Society, 1-15. ÓCarrigáin, T. 2010. Churches in Early Medieval Ireland. London: Yale University Press. Ó Danachair, C. (1955). The holy wells of Co. Limerick. JRSAI Vol. LXXXV, pt. II, pp. 193-217. St Colmán’s well/ Tobar Cholmáin is part of the monastic landscape of Oughtmama a small but significant monastic site located in a valley above Turlough Hill in the Burren in Co Clare. View of Oughtmama churches from pathway leading to Tobar Cholmán. Oughtmama was associated with three different St Colmán’s one of which was St Colmán Mac Duagh the patron saint of the dioceses of Kilmacduagh and it is this Colmán who is the patron of the nearby holy well. According to folklore it was said the saint came to the site in his retirement seeking a life of solitude. He later died here and was brought back to Kilmacduagh for burial. The well is located on a steep northeastern slope of the valley above the monastic site. It consists of a rectangular stone walled enclosure with steps leading down to the water in the well. A tree growing out of a loose pile of stones and a leacht (a small stone built cairn of stones), are found on either side of the well. migrated from its original position and broke out a short distance lower on the slope of the hill, where it is now known by the new name of Sruthan na Naomh, the Rivulet of the Saints; but its original locality which is still called Tobar Cholmain has a square enclosure of stones, in the centre of which grows a small, stunted, white thorn bush, exhibiting votive rags of various colours. This well is inbued with extraordinary naturally medicinal, or supernaturally miraculous virtues, for people have often washed their eyes in it, which were veiled with thick pearls, and ere they had completed the third washing these pearls (films) fell off leaving the eyes perfectly bright and clear-sighted . In the late 1830s when he Ordnance Survey Letters were written a pattern was still held here annually on the 15th November in honor of St. Colmán feast day. 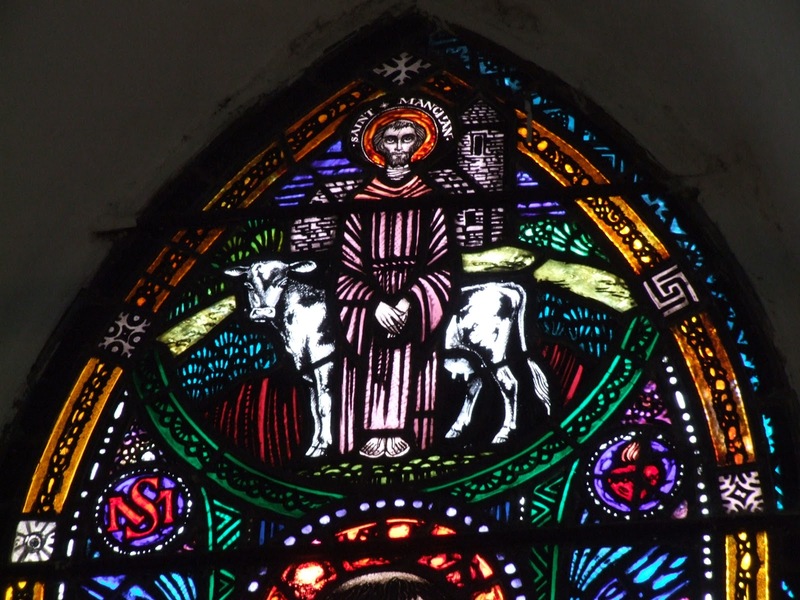 Elsewhere St Colmán’s feast was celebrated on the 29th of October especially in the diocese of Kilmacduagh but at Oughtmama the feast was celebrated on the 15th of November. The pattern day, was a day when people came together to perform pilgrimage at a holy well or saints grave, usually on the saints feast day. Such gatherings were very popular during the 17th, 18th and 19th centuries. Secular celebration such as dancing, drinking and stalls selling food and trinkets more often than not took place along side religious devotion during this period. Alcohol seems to have been a key component in secular aspect of the celebrations on the day and pattern day could be rowdy affairs and a large number became the scene of faction fighting and violence and disorderly behavior (Nugent & Scriven 2015, 18). The unsocial behavior lead to much disapproval from the state and both the established Church as well as the Catholic church and attempts, many of which were successful, were undertaken to suppress the pattern day celebrations. By the end of the 19th century many had died out. It is not clear when exactly the pattern day at Oughtmama died out but it is no longer part of of the modern pilgrim traditions. 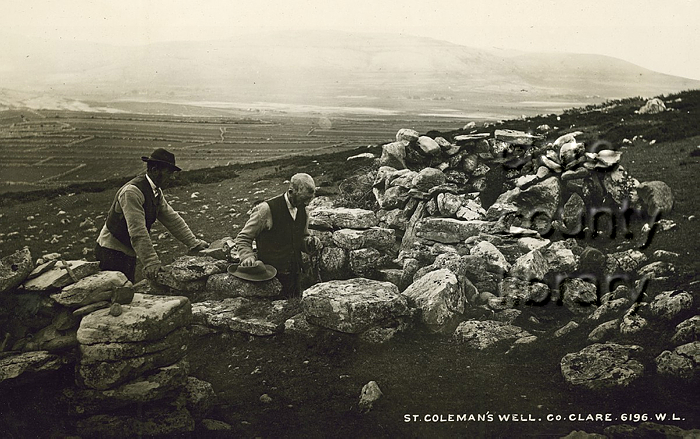 Image of pilgrims from the Lawrence Collection entitled ‘View of two men at St Coleman’s Well in Oughtmama, known as Tobercolman.’ from Clare County Library collection. Today the well is visited by tourists and pilgrims although the numbers of the latter have steadily declined. The votive offerings and rags tied to the tree beside the well show the continuation of pilgrims to the well. 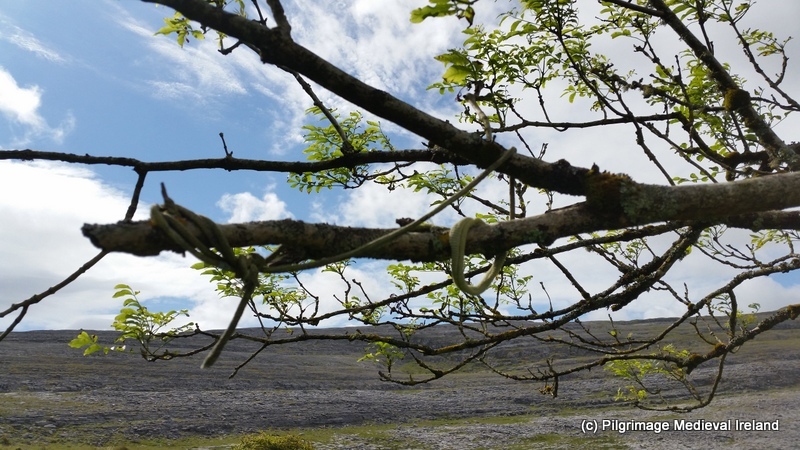 Piece of cord tied to tree at St Colmán well Oughtmama. Nugent, L. & Scriven, R. 2015. Wells, Graves & Statues. Exploring the heritage & culture of pilgrimage in medieval & modern Cork city. Cork City Council: Cork. O’Donovan, J. and Curry E. 1839. ‘The Ordnance Survey Letters of Co Clare’, http://www.clarelibrary.ie/eolas/coclare/history/osl/oughtmama3_masduachs_well.htm. Yesterday Dungarvan historian John Donovan brought me to see a holy well in Dungarvan associated with the famine. 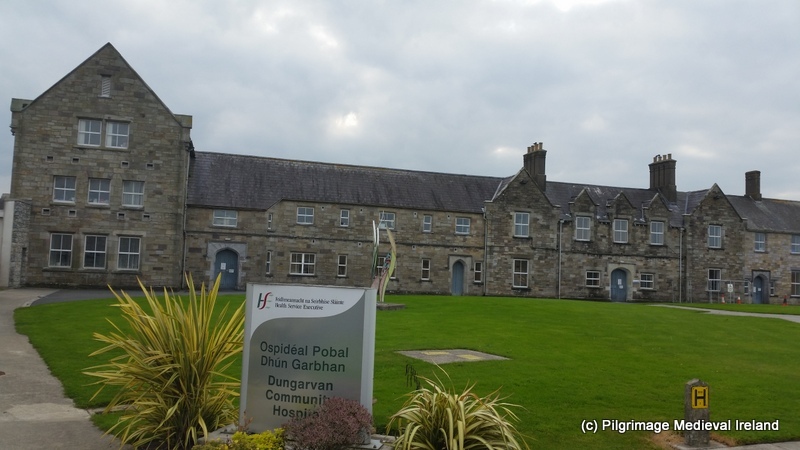 The well is located just outside the walls of the old work house now Dungarvan Community hospital in the Springmount area of Dungarvan. The old Work House in Dungarvan now the Community Hospital. 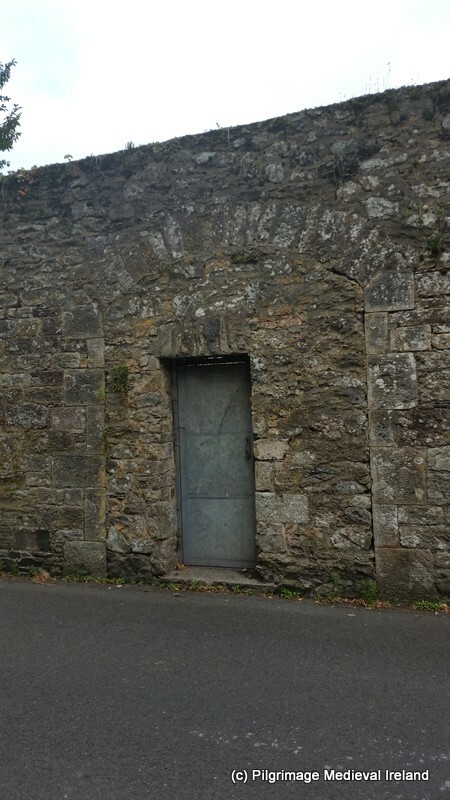 Tradition for the areas tells that during the famine when the dead were brought from the workhouse they were carried on a cart through a gate into the wall that surrounded the workhouse. The holy well was located opposite this gateway. 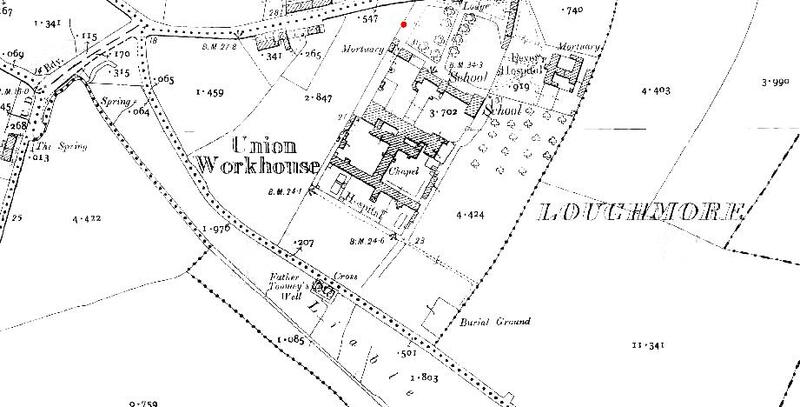 It was said that a local priest called Fr Twomey would come to the well each day and bless the dead with its water as they left the workhouse on their final journey to the burial ground. Gate from Work House opposite the holy well. These actions had such an impact on local memory that the road the well is located on is known as Fr Twomey’s road. Another account of origin of the well is found Schools’ Folklore Collection recorded in the 1930’s. This account recalls that the priest ‘Rev Fr Toomey of the order of St Augustine was resident in this town‘. He had a vision in which the Blessed Virgin appeared to him and asked him to clean up the well and build walls around it. The same account tells that the well was a focus of pilgrimage from the mid 19th century with devotion continuing into the 20th century. Rounds are to be made for nine days and certain prayers recited. Some people sat five Our Fathers and five Hail Marys, others recite the Rosary during the rounds, and bathe the part of the body afflicted. This well is renowned for the cure of skin trouble. The account goes on to say the priest died in 1879 and was buried in the Friary Church in Dungarvan. The well was not marked on the 1st ed. (1841) OS 6-inch map for the area. The wells absence from the map combined with the folklore evidence may suggest that the well came into existence around this date. The well was marked as a rectangular enclosed area along with a cross on the 2nd ed. (1905) OS 6-inch map and the 25-inch (1907) OS map and named as Father Twomey’s well. Today the well is a sad sight, devotion has long ceased the cross marked on earlier maps no longer survives. The outer wall was destroyed by a truck some years back and the council later widening the road extending the road into part of the well. What survives is covered in concrete and has a rather ugly appearance. In its current position it is hard to imagine that this was once a pilgrimage site and I couldn’t help but wonder what it looked like in times past. I am going to see if I can find out any more about the well and will keep you posted. In County Longford the watercress plant was traditionally known as St Patrick’s Cabbage. 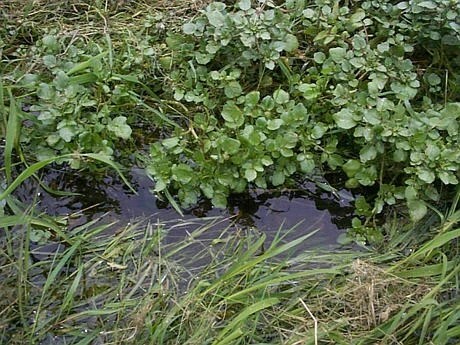 Watercress is peppery tasting plant and was traditionally an important food in Ireland. It was also held to have medicinal properties. Mac, Coitir, N. 2006. Irish Wild Plands, Myths, Legends and Folklore. Cork: The Coillins Press.